A box of Nutra-Sooth usually costs a good deal less than a box of oilated AVEENO. But it also contains .65% more active ingredient (colloidal oatmeal). And it gives patients more easy-to-use, pre-measured packets - nine com pared to eight. Nutra-Soothe Colloidal Oat -meal temporarily relieves itching due to dry skin, rashes, eczema, psoriasis (copy continues). 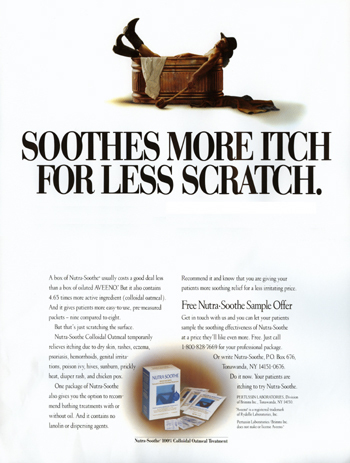 This was part of a campaign written for Brimms' product, Nutra-Soothe. Brimms was a former client of the former Buffalo, NY agency, Wolf Mansfield Bolling.